This unusual and attractive 12 x 12 sheet from K & C has texture similar to a relief map. That's lost on the web of course. But there's no shame in letting a paper set the agenda for your school scrapbook layout, if that paper's design is so well in tune with your theme. Although I didn't want to overembellish (did that enough in exams) I thought a scroll might fit the bill. Vellum is ideal for this, and I dressed it with red ribbon from Essential Craft. These rub-on transfers are from Papermania, and I used the same blue Bazzill Basics cardstock for the 'subject tags' as I did for the photo matting. Rub-on transfers directly on to a photo don't work too well. Won't be trying that one again! Well the dodgy looking teacher in the mortar board (do teachers still wear those?) is me at 45. I'd left school by then after several retakes. Then that's me aged 10 in the black and white look - popular at the time. 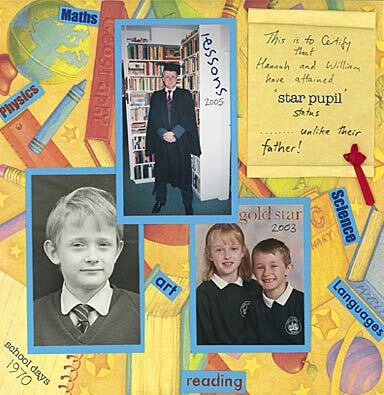 My children - my son looking like a coloured-in version of me - are in the 'gold star' section. I have an excellent resource now for layout ideas - which is a book by Jen Gormley, crammed full of sketched templates for page layouts. I wish I'd found it before I made most of my layouts, but for next time I'll certainly use one of Jen's sketches - especially when I don't have any inspiration (ie. quite often!). There's a great sample on this page about half way down - of how you could turn a line drawn sketch into a truly stunning layout. Well, I guess you could always rely on the ol' faithful Graduation layout , but boy did I hesitate before putting this mugshot on the net!! That sad four-eyed specimen with a dodgy hair and desperate moustache is me. Let's move on. 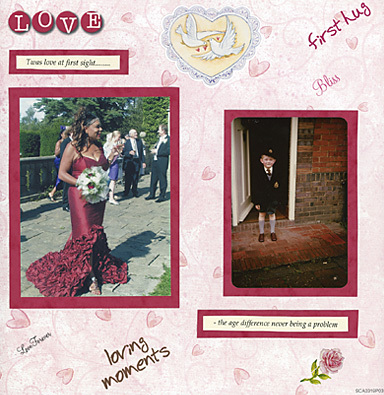 You could always create a 'First Day at School' layout - although I ended up using my one photo of this occasion in a wedding layout. Go figure!
. Where are all those guys today? !